Celebrate the diverse ethnic communities of the Museum at Eldridge Street’s Lower East Side/Chinatown neighborhood. With the Museum’s home, the landmark Eldridge Street Synagogue, as its centerpiece, this neighborhood festival spills out onto the street with a mash-up of Jewish, Chinese and Puerto Rican tastes, traditions, sights and sounds. Download the Festival Schedule and Floor Plan. Lots of fun! Enjoy performances of Chinese opera, Chinese folk, klezmer, cantorial, and Puerto Rican bomba music. Watch fascinating demonstrations by a Hebrew and a Chinese scribe, Puerto Rican mask maker, and other folk artists. Learn how to braid challahs and make dumplings and empanadas at our food demonstrations. Partake in a multitude of crafts including yarmulke making, mask making, lace making and more. Try your hand at a fierce game of mah jongg with community mavens. Kosher egg rolls, egg creams and empanadas will be sold. 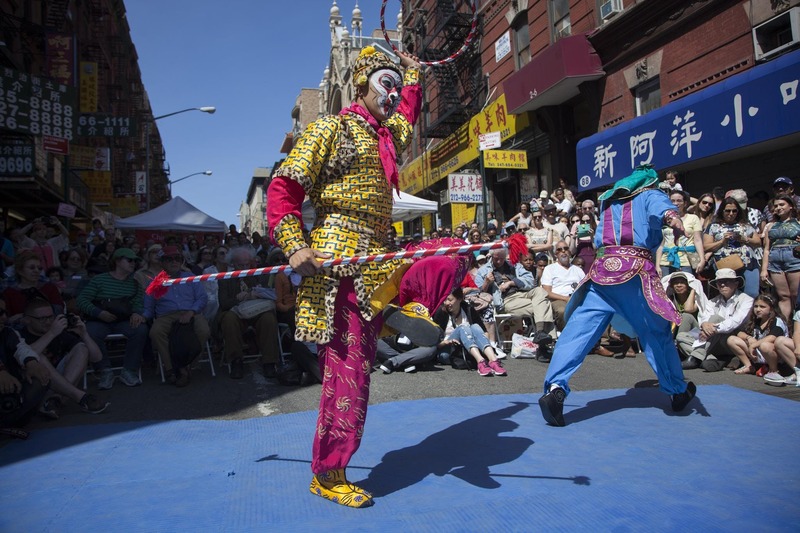 This neighborhood festival began as a celebration of Jewish and Chinese culture. Today it has become the Museum at Eldridge Street’s signature event with thousands of people joining us every year. By popular demand we have expanded the festival to also showcase the contributions of the neighborhood’s Puerto Rican community. Blog Post: A behind-the-scenes look at our Egg Rolls, Egg Creams & Empanadas Festival. The Festival showcases cultural commonalities while preserving the distinctive voice of each community. Highlights of this year’s festival include performances by klezmer virtuoso Frank London and band, the Chinatown Senior Center Orchestra, EastRiver Ensemble and Cantor Eric Freeman. The festival lies at the heart of the Museum at Eldridge Street’s mission. In the most public and joyful of ways, we celebrate the synagogue’s Jewish culture and heritage and embrace the ethnically diverse neighborhood in which it now stands. Photography at the Festival is encouraged! In fact, we will be hosting an Instagram contest. To enter (a) Follow the Museum on Instagram @museumateldridgestreet.org; (b) Post your photo(s) on Instagram with our festival hashtags: #eggrollsandeggcreams and #museumateldridgestreet; (c) Tag two friends in the comments section of your post. The winner will receive two free tickets to a tour or public program of your choice. We’ll choose our three favorite entries on June 20, feature them on our Instagram page, and DM each winner to arrange for your prize. Egg Rolls, Egg Creams & Empanadas is funded by the National Endowment for the Arts, New York City Council/The Honorable Margaret Chin, New York City Department of Cultural Affairs in Partnership with the City Council, New York State Council on the Arts with the support of Governor Andrew Cuomo and the New York State Legislature, NYC & Co. Foundation and Valley National Bank. The Museum is grateful to the Brooklyn Seltzer Boys and Fox’sU-Bet for their food donations.